Today I planned on posting some tunes for you to jam to but when I woke up this morning, I was going through my folders of work that I have still yet to post. "Where do I begin!?" I thought. Y'all...I would like you to meet my Mamaw and Papaw. This is Billie Wanda and Joe Ray Johnson. Yes, these are real, legit, born and bread names coming to you from the heart of Texas. Doesn't get more southern than that now does it? :) These two muffins mean the entire world to me. They are full of love, life, and have the biggest hearts I've ever known. They are two goofballs with sense of humors that I admire in a million and one ways. They are my heroes and the biggest role models in my life to date. Do you remember this video I made of them? If not, then please watch it. It is my most valued possession. They are the epitome of what real love should be. It's the love I strive to have. 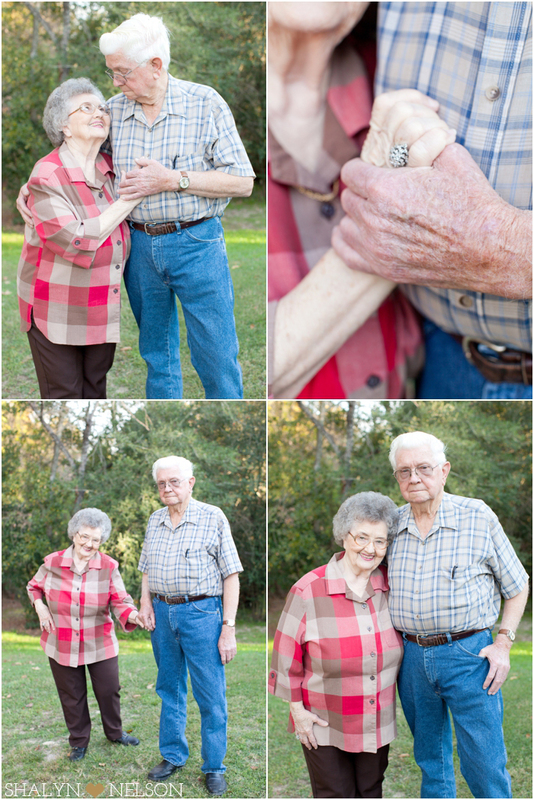 When I edited these photos I caught myself studying their delicate, tired, and wrinkled hands embracing one another. It just melted my heart and filled my soul with more happiness than I can fathom. I am so thankful I have them. I am so thankful I know them. I am so thankful they are my grandparents. The laughter that they still eloquently share is a beautiful reminder. This is real love. The real deal. They have done the hard work and never gave up. Y'all, tears fill my eyes everytime I look at these. When I went to Making Things Happen in Chicago last fall, we were called upon to share what we wanted in life while laying on the ground and with our eyes closed. What is life really all about for you? Is it about being the most successful person? Is it about being the most beautiful woman? Is it about being the best of the best? Is it about having the best house? Having the best things? The most friends? The better car? The better credentials? The better clothes? The better of well, everything? Is that what life really means to you? Or is it about love? At the end of the day...love is what makes me breathe. It is what makes this life worth living. "At the end of this life, I just want to be old and gray, hand in hand, walking down the sidewalk smiling and laughing with Drew." 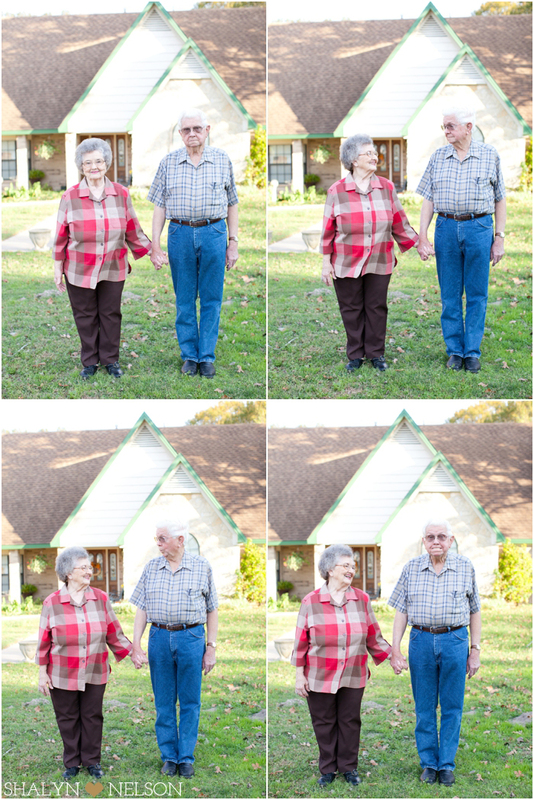 As I looked through these photos of my grandparents, that feeling came back to me, and for a minute, I imagined Drew and I in these photos. If at the end of this life, I can be here. Like this. Old, gray, wrinkled, with my best friend ... My life will have been worth it. All of the ups and downs that life throws our way...none of that matters. "Mamaw, show me some sass girlfriend! Work itttt! Work it!" And she put her hand on her hip and my heart melted. Is she not the cutest? "Papaw, throw your hands in the air like you'z a true playaaaaa!" And he put his hand in the air...like a true player. I can't even deal. He's just my favorite. I love these two more than words will ever say. I hope you live your life for love y'all. I don't see how it could be any better than that. "Walking through life together...but the trail is getting short." dying. this was the best ever. entire body goosebumps. i love them so much!!! Shay... these photos made me tear up. What a perfect gift that you can treasure forever. I just love grandparents! I was tearing up too haha! This post is amazing! Sooo lovely,reminded me of whats truely important. Im actually moved. You're grandparents are possibly the coolest I've ever seen haha! Great post and even better photos to go along with it! I think this is the best post I've ever read with THE sweetest pictures I've ever seen. I laughed out loud, so hard, when your grandma put her hand on her hip and your grandpa put his hands up like he just didn't care ;) SO precious. LOVE this so incredibly much. Sharing on FB. I have tears in my eyes. dying over this post. it was GORGEOUS, those two are seriously the cutest I've seen and inspire me to live in love. I'm literally sitting here at my desk crying. I needed to read this. It makes all the struggles seem worth it! They are so cute, and you can see the love between them. Beautiful pictures! Oh my gosh, my heart is melting into a puddle on the floor. These pictures are so beautiful and I hope that when my fiancé and I are old and grey we still look at each other like your grandparents do. Beautiful pictures!! might be one of my favorite photoshoots i have ever seen in my entire life NO JOKE. I strive to be like this one day!! and I know for a big old fact you and ddhp will be the exact same! o.m.goodness they are precious! you did an amazing job of capturing their love and true happiness. This is just too much! Sweetest thing on the entire internet....right here. Bless your sweet mamaw and papaw! yep. heart definitelyyyy just exploded. this is too much amazingness to even handle!! i just pray one day my love is this strong! Tears in my eyes. Beautiful. That is real love. So precious to see two people still so in love after so many years. They are the cutest things ever! How sweet! This post is precious! Thank you so much for sharing what truly matters most in life. You have a way of capturing the hearts of people! Sobbing, and sobbing, and sobbing! I want it to be... just like that! Absolutely amazing. OH My Gosh. You were right - my heart did just explode, and my eyes got a little watery, and now I just want to stare at these pictures, and then give them a giant hug. They are precious. And you did an amazing job capturing their love for each, and their personalities as well! love everything about this post. Oh so much. I still remember the video... loved that and love these pictures! They are SO precious! Tears and lots more tears! This is the sweetest thing ever. These are so so priceless! Tears are flowing! Absolutely precious!!!! oh my god. how freaking cute are they?! the hand on the hip and hand in the air? i die. love this! Cutest, sweetest post!!! 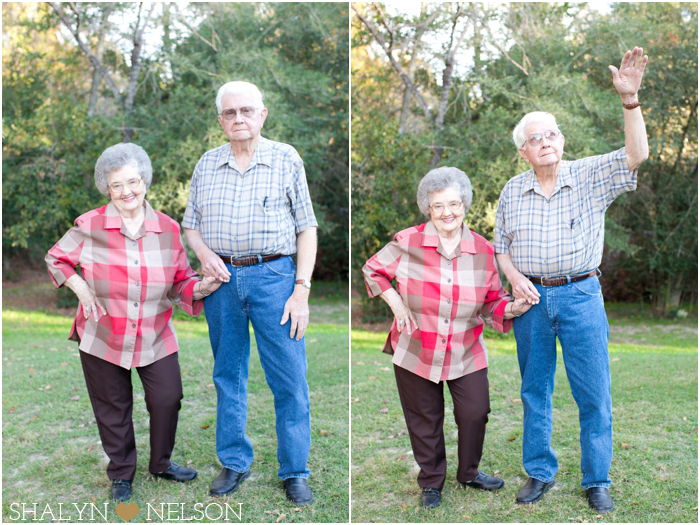 Your grandparents are precious! :) Those pictures are too fun. Omg...the last picture just kills me!! So sweet. You are so very blessed to still have your grandparents in your life. All I had growing up was one grandmother ~ and she's been gone for a while now....Truly treasure these pictures! This is the most precious thing....EVER! Yes, my heart EXPLODED! OMG your mamaw working it with her hips, and your papaw throwin his hands up in the air like a true playa! Too much! This is the sweetest, most beautiful post ever. Your grandparents are truly lovely and precious! Oh, and that heart pose at the end.... ahh, love!!! I'm not sure that there's anything to say here other than I am ABSOLUTELY DYING!!! SO stinking precious!!! Okay, I am in TEARS!! These just made me so happy and I'm going to call up my sweet mexi grandma and grandpa and do a photoshoot just for them!! Really. You've inspired me today sweetness! You're a gem and I LOVE you! Oh.Em.Gee. That was too adorable for words!! I love them and I don't even know them! This is adorable! They are the cutest ever! Awww.. this is so cute :) I don't think I've ever commented on your blog, but you, Drew, the fur babies, your grandparents and your blog are adorable. 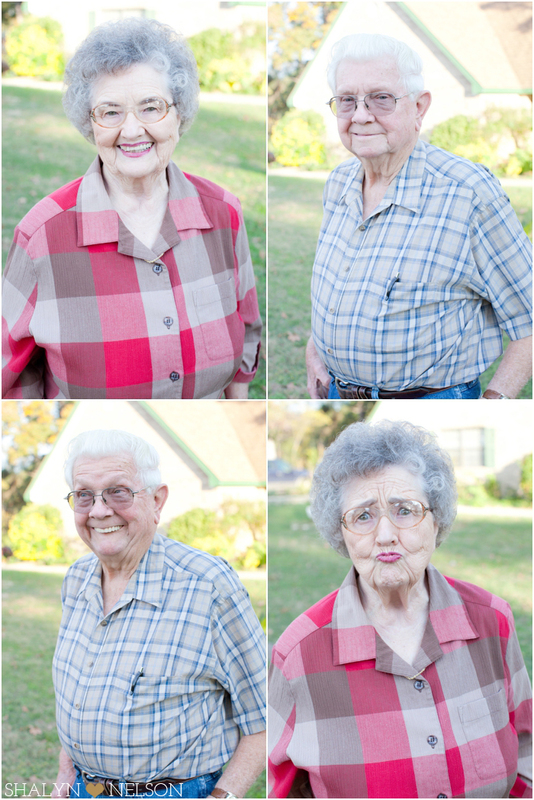 Senior (citizen) portraits...OMG!! I DIE!! This is THE most precious thing ever. EVER. My co-worker and I just got tears in our eyes reading the quote from your Papaw. They are too cute for words!! Will you take mine and Beau's senior (citizen) photos when we're old and gray?! Puh-puh-puh-please?! I am bawling! This (and that video) are THE BEST things ever! what a special couple and what a perfect reminder of the truly important things in life - love and laughter! Just the cutest thing i've ever seen! I only had one surviving grandparent on both sides of my family so i've never been witness to this but a few years before my grandmother passed she was telling stories about how her children hated having male work-hands on the farm after her husband passed (He died when my father was just 6) because they thought they might replace their father, she said to me 'Like anyone could ever replace my Scotty'. A love that waited over 50 years to be together again, that kind of love is beautiful. When I look at them I honestly see my parents in the future. They are high school sweethearts who have known one another since they were five. So I can tell that this will be them. This is so amazing and so rare, you are truly blessed! DYING!!!!!!!!!!!!!!!!!!!!!! This made my heart jump for joy!!! Ugh stop. It's so beautiful! So encouraging to see couples like this. They're precious! Helloooo! I don't know if I want to cry, laugh, smile, WHAT! They are precious, precious! this is the sweetest post ive ever read. i had the LONGEST day today and this just brightened my whole mood! you are so lucky to have such wonderful grandparents! I'm currently trying to mop up my heart that just melted on the floor. Thank you for this, love! Best thing ever. absolutely just cried my eyes out. how adorable! what an amazing treasure to have.. Lump in my throat. (In a good, aww my heart is full & mushy way) How absolutely adorable! 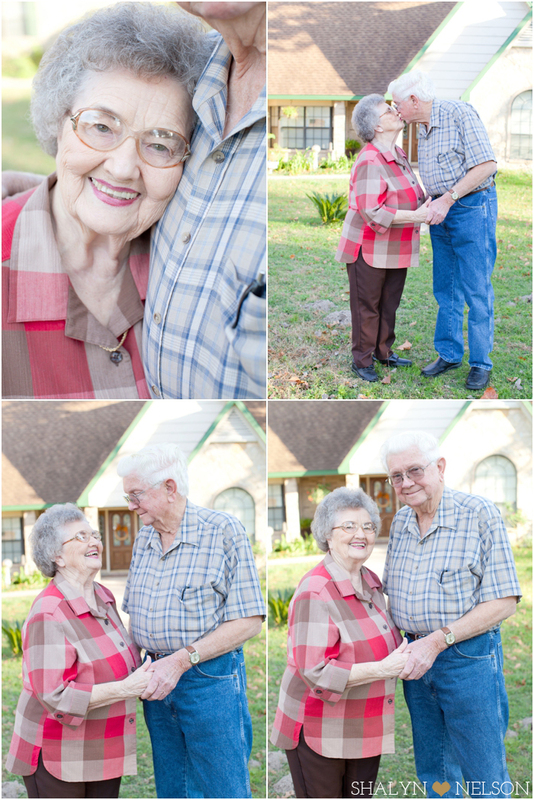 I love that you have these pictures of your grand parents & you'll have them to treasure forever! what a treasure! love these! I'm sure you already know what a treat it is to have these photos of them to hold onto! out of all of your pictures, these are my favorite. you can just see the love they have. i completely understand how you feel about drew, because that's how i feel about zac. i don't need anything fancy, i just need him. These pictures are sweet. How awesome you get to enjoy these two incredible individuals. I watched your video a while back and it left me without words...they are the the people I want to be with my husband someday. that sweet old couple. be so blessed knowing you have them! 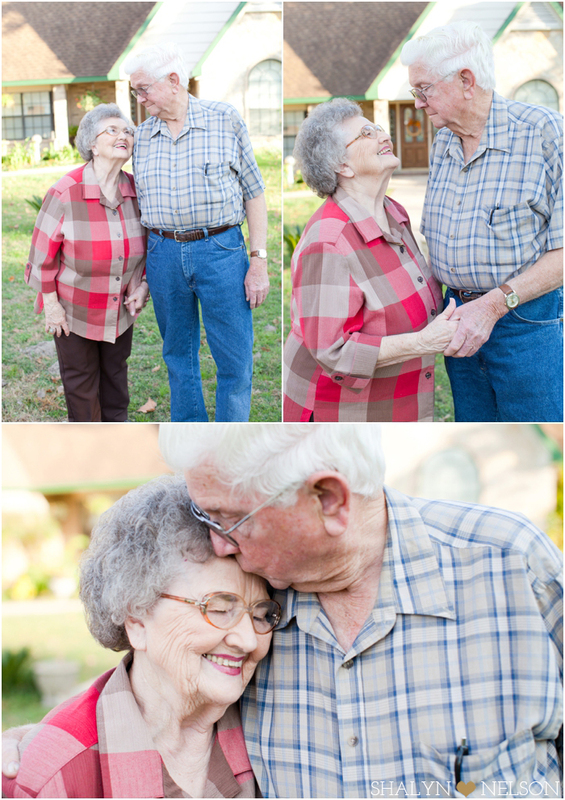 They remind me of my sweet grandparents- Fern & Howard. Also from TX. Also my heroes. 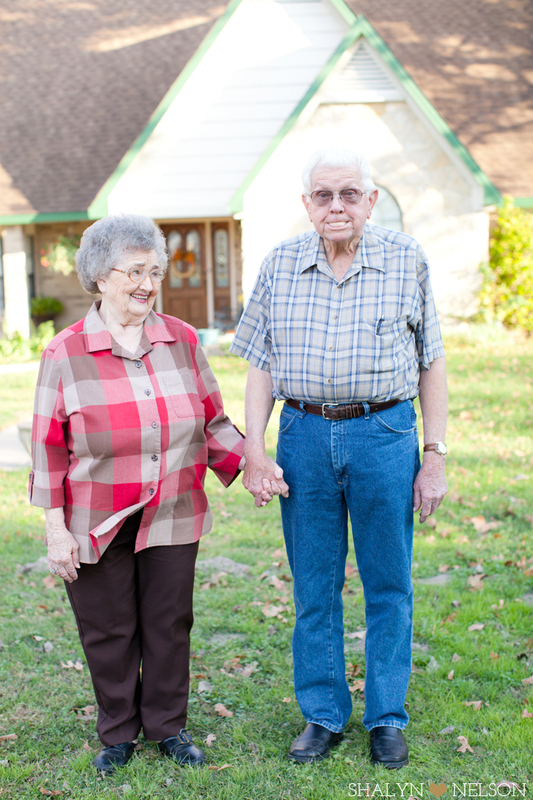 She kept him at home with her through 10 yrs of Alzheimer's. Always gentle, patient & loving. 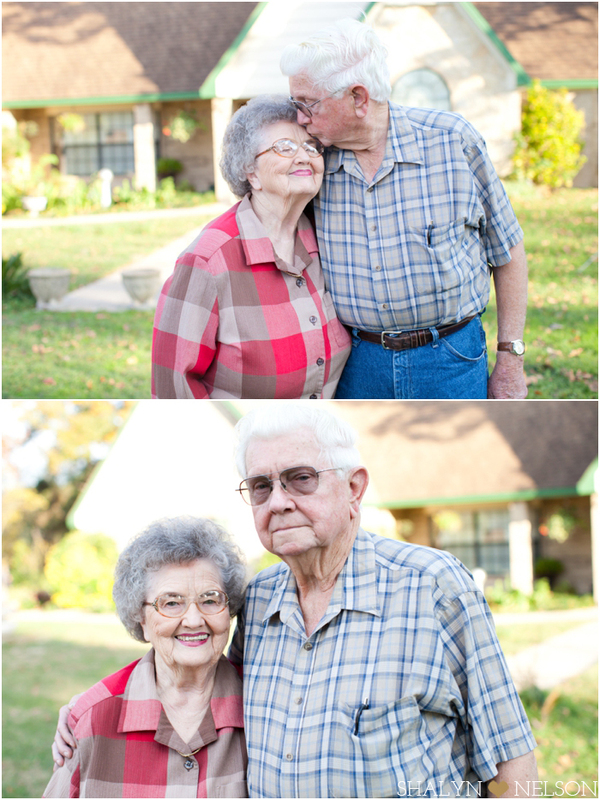 Such a treasure to have grandparents who's marriage serves as a testimony of love. heart...exploded. ohhh my gosh they are THE CUTEST people ever!!! seriously, shay? they are the cutest. i'm picking the pieces of my heart off the ground. mannnnn, i pray i'll be lucky enough to experience love like this or what you have with ddhp. thank you for sharing these gorgeous pictures. This is the sweetest blog post I have ever read! 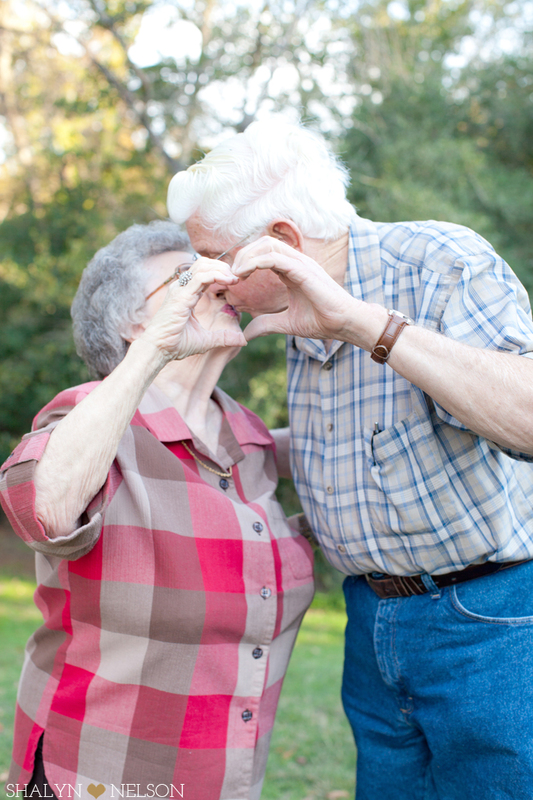 Your grandparents are so sweet and these photos are incredible! Everything you wrote really put life into perspective, at the end of the day it's not about the small things, it's about love! Thank you for this inspirational post, I truly enjoyed it! Oh. My. Gosh. They are SO PRECIOUS!!!! I literally almost started crying. So hope I have that one day! OH MY GOODNESS... they are ADORABLE! I can only hope that one day I am still as in love with my future husband as they are. They are truly a couple to aspire to! i could cry right now! literally. this is the cutest thing ever!!!! i pray this is me and Kev in 50 years :-) so darn sweet. This is the most beautiful post ever. Love the photos and videos. Bittersweet for me - - my grandfather, Joe, was buried yesterday, finally rejoining the love of his life, Alice, who passed away in 2003. They were married 58 years. This is the sweetest thing Ive ever seen! I teared up reading this because I think ultimately in life all anyone wants/needs is love. And, my grandma's name is Georgia, her younger sister was Billie. Your grandma's outfit looks just like something my Grandma would wear. Such a cute family you have. Seriously I will pay you guys to adopt me into your family. You guys are the cutest and Mamaw and Papaw make my heart melt into a ooey gooey mess.